Kawagoe : Town where Yamate Japanese Language School located. 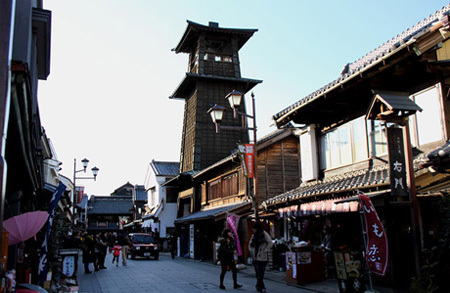 During the Edo period, Kawagoe was a prosperous castle town called “Little Edo”. The city shows a castle and many shrines, temples, historic spot and ancient buildings. It`s the third city in Kanto region, after Kamakura in Kanagawa prefecture and Nikko in Tochigi prefecture, to have many cultural assets. Kawagoe is a famous tourist destination also because is very close to Tokyo, in a year about 6 million of visitor explore it. It is also the regional hub city of Saitama prefecture and in counts more than 350,000 population. Kawagoe City is located 30km from Tokyo. It is a little bit closer to Tokyo than the center of Saitama Prefecture. Kawagoe city center is directly connected to Tokyo. From Kawagoe, Kawagoe-shi and Honkawagoe station is possible to reach Shinjuku, Shibuya and Ikebukuro without changing train. The Toki no kane is one of the best tourist spot of Kawagoe. It has become the symbol of the city. Local people may call it also Kane Tsuki To, the Tower Bell. The structure has 3 floors and its height is 16 meters. In the past its sound was used to let people know the time, nowadays a mechanic device rings 4 times a day (6 a.m., midday, 3p.m., 6p.m.). In 1996 the Time bell was chosen by the Environmental Agency Sponsorship as one of the “100 Sound Landscapes of Japan”. 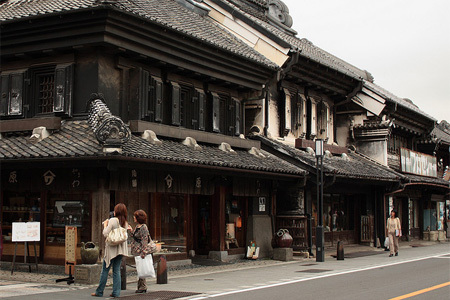 In Kawagoe there are the characteristic old style warehouses which in origin were built as Edo`s fireproof ranch houses. Nowadays in Tokyo there aren’t such old style buildings anymore. In December 1999 these buildings were selected for the project called “Important Preservation Districts for Groups of Historic Buildings”, and in January 2007 selected as one of the “Top 100 Japanese Beautiful Historical Parks”. Candy Alley (菓子屋横丁, Kashiya Yokochō), a lot of candy and sweets had been made in this street since the beginning of Meiji. 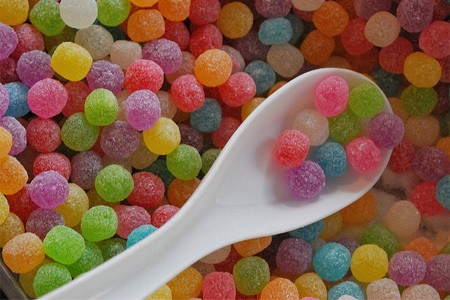 Immediately following the Great Earthquake of 1923, Tokyo experienced a great shortfall in supply of Japanese sweets; orders made to the candy stores in Kashiya Yokocho thereby surged, and the numbers of stores at the beginning of Showa was over than 70.